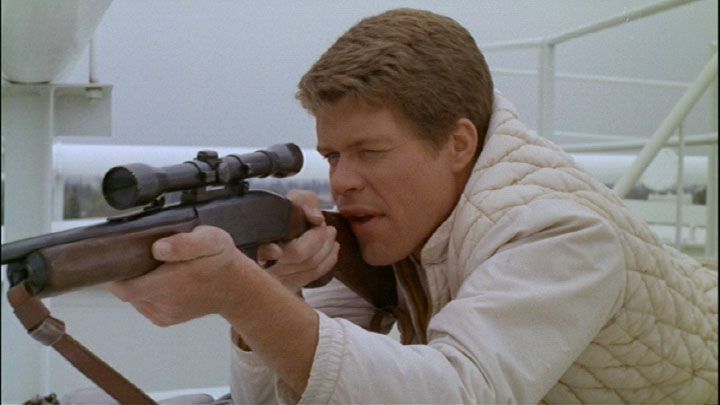 Today, I’m going to take a look at a controversial cult classic: Peter Bogdanovich’s 1968 feature, Targets. An elderly horror-film star, while making a personal appearance at a drive-in theater, confronts a psychotic Viet Nam War veteran who’s turned into a mass-murdering sniper. Targets was written, produced, edited, and directed by Peter Bogdanovich, a lauded film critic who became one of the stalwart figures of the New Hollywood movement. After Targets, he built a strong career that included features like The Last Picture Show, What’s Up, Doc?, Mask, Paper Moon, Daisy Miller, and At Long Last Love, among many others. His wife at the time, Polly Platt, is credited as both his co-writer and the film’s production designer. She later gained more notoriety as a producer on such movies as Bottle Rocket, The War of The Roses, Broadcast News, and Say Anything. The cinematographer on Targets was Laszlo Kovacs, who had a lengthy and notable career shooting films like Easy Rider, Shampoo, Paper Moon, Say Anything, and New York, New York. Roger Corman was an uncredited executive producer for the film, and was instrumental in its creation. 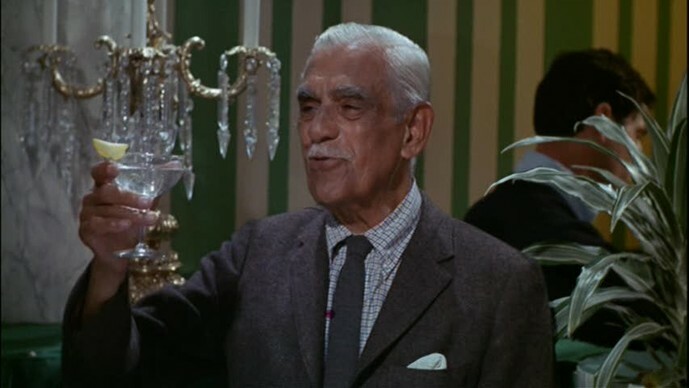 He essentially gave Bogdanovich free reign on the project with a set budget, provided that he was able to make use of stock footage from a previous Corman production, The Terror, and found a way to use the elderly Boris Karloff for just two days. Ultimately, Karloff was needed for five days of shooting, but he waived his fee thanks to his fondness for the screenplay. The shooting spree featured in Targets was inspired by true events, most notably the 1965 Highway 101 sniper attack, in which a sniper fired on moving cars from a nearby hill, and the Charles Whitman shootings at the University of Texas in 1966. The realistic depictions of mass shootings caused the film to be particularly controversial, even for a b-feature intended for a niche audience. 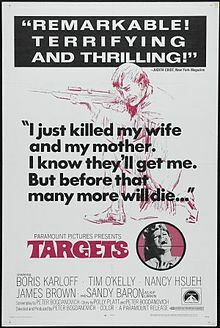 Samuel Fuller, a noted writer and director in his own right, apparently contributed significantly to the screenplay for Targets, but turned down credit for the movie. 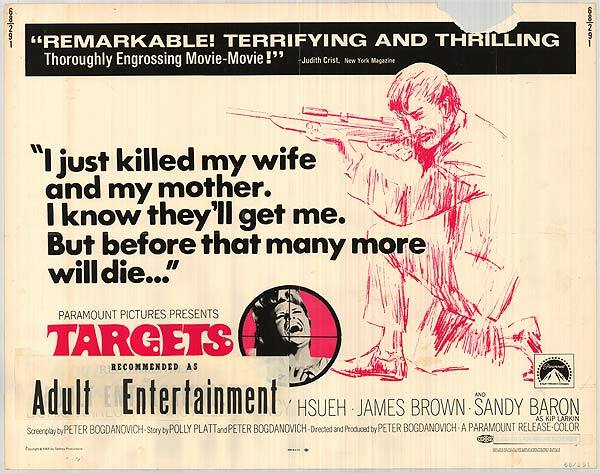 Targets is regarded as one of the starting points for a new era in film horror, as well as a key point in the development of New Hollywood. Books like Shock Value and Easy Riders, Raging Bulls have gone into detail about the film’s production, and how it influenced Bogdanovich’s career and the way audiences thought about horror. Targets currently has Rotten Tomatoes ratings of 88% from critics and 81% from audiences, along with an IMDb user score of 7.4/10. Its reputation over the years has only grown, as its influence has been felt and appreciated both in and outside of the horror genre. Targets is, above all else, an effectively eerie movie. The lack of a soundtrack in particular gives the tense and shocking sequences a more pronounced and uncomfortable vibe. There are no cues to indicate what the audience’s reaction should be to any given action, which plays into the fact that the audience is subjected to the killer’s perspective for most of the movie. He doesn’t react to killing someone, and the film doesn’t either. I think that this apect, more so than the shooting sequences themselves, is what made the film so controversial and uncomfortable for people. Murder wasn’t a new topic for film, but showing it from a killer’s perspective was (and still is) genuinely unnerving. While there are a lot of impressive elements to Targets, it is far from a perfect movie. As with most debut features, it is a little rough around the edges, particularly when it comes to the pacing of events. There are some distinct moments where the lulls in progress last a bit too long, but that said, this is a damn impressive first flick. While Bogdanovich arguably peaked early and has waned since the 1970s, this film provides a good overarching sense of his talents and potential. For fans of b-movies, horror movies, the New Hollywood era, or even just film history in general, Targets is worth your time to dig up in my opinion. 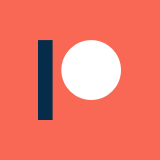 There are a lot of things to like about it, and they certainly far outweigh the negatives.